This prestigious award—the highest honor bestowed by the Iowa State University College of Design—is presented each fall semester as part of the ISU Alumni Association’s annual Homecoming Honors and Awards Ceremony. 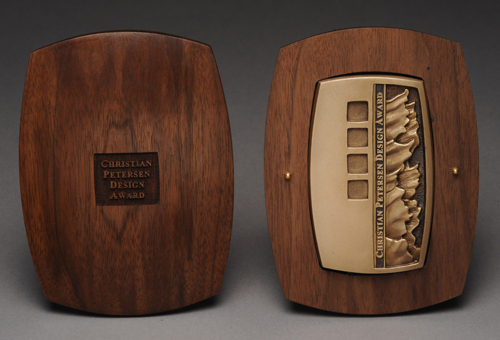 Until 2009, honorees received a framed certificate and a bronze bust of Christian Petersen, the noted artist who served as Iowa State’s sculptor-in-residence from 1934 to 1955. In 2009, the bust was replaced by a new bronze medallion designed by Joe Muench, ISU associate professor of integrated studio arts. 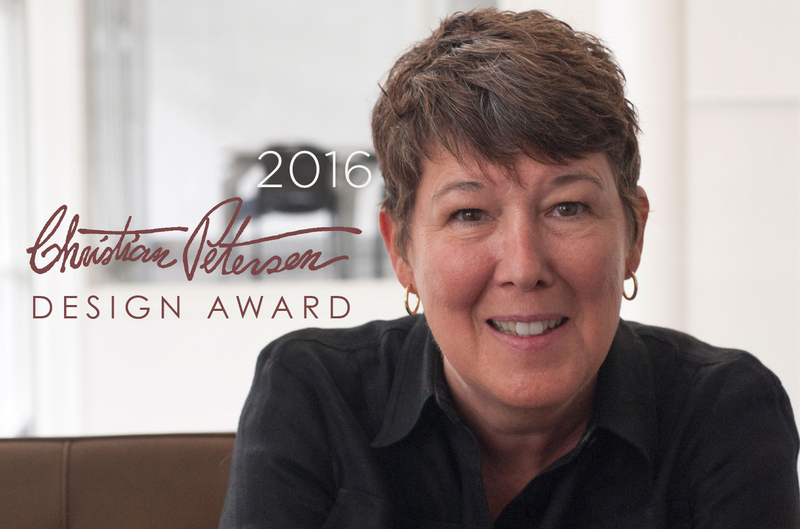 Each year a new page featuring the most recent honoree’s photo and award citation also is added to the Christian Petersen Design Award portfolio. View the citations that appear in this portfolio. Established in 1988 to recognize outstanding creative and professional achievements of alumni in all of the college’s disciplines. 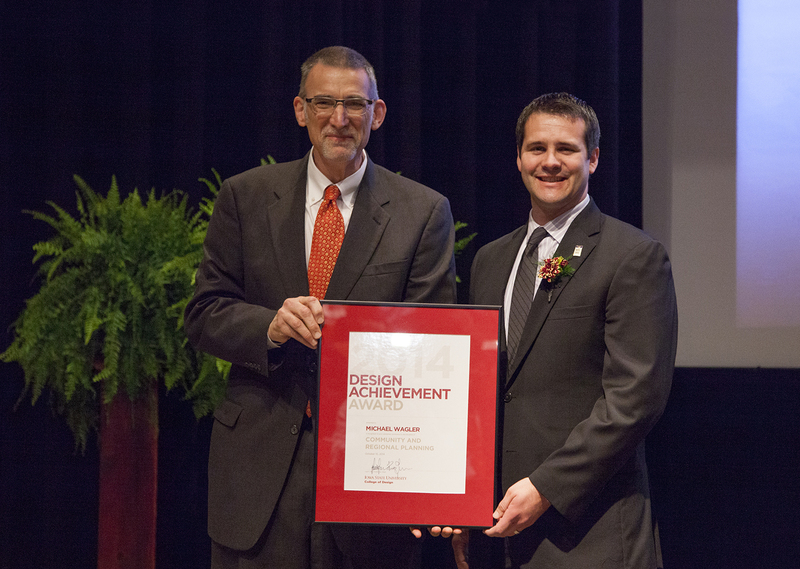 The Design Achievement Award is presented each fall semester as part of the ISU Alumni Association’s annual Homecoming Honors and Awards Ceremony. Honorees receive a framed certificate, and their photos and award citations are published in the ceremony program. The Distinguished Alumni Award, established in 1961, is the highest honor given to alumni by Iowa State University through the ISU Alumni Association. This award honors ISU alumni who are nationally and/or internationally recognized for preeminent contributions to their professions or life’s work. Up to five awards are granted annually. The Honorary Alumni Award, established in 1968, is the highest honor given by Iowa State University through the ISU Alumni Association to individuals who are not graduates of Iowa State and who have made significant contributions to ISU’s welfare, reputation, prestige and pursuit of excellence. The Alumni Medal, established in 1948, recognizes ISU alumni for long, loyal service to the university through alumni-related activities. Up to three medals are granted annually. The Alumni Merit Award, established in 1932, recognizes ISU alumni for outstanding contributions to human welfare that transcend purely professional accomplishments and bring honor to the university. Up to three awards are granted annually. 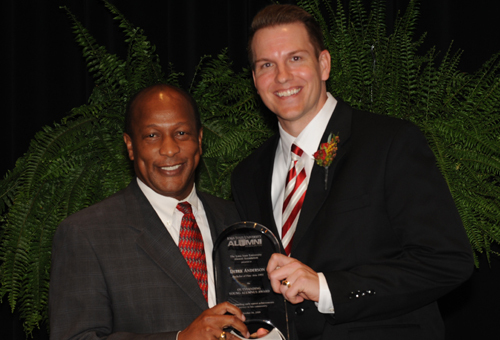 The Outstanding Young Alumni Award, established in 1968, recognizes ISU alumni, age 40 and under, who have excelled in their professions and provided service to their communities. The James Hopson Alumni Volunteer Award, established in 1999, recognizes ISU alumni, age 40 and under, who demonstrate early volunteer leadership in the ISU Alumni Association or alumni-related activities and who are members of the ISU Alumni Association. The Impact Award, established in 2000, recognizes individuals, businesses, organizations or units whose programs or accomplishments brought broad recognition tot he university and increased the involvement of ISU constituents in the life of the university in the year prior to being nominated. The Alumni Service Award, established in 2006, recognizes ISU alumni and friends whose self-initiated activities and service consistently support the daily work of the ISU Alumni Association in further connecting alumni, students and friends to the university. The Iowa STATEment Makers award recognizes alumni under the age of 34 who have made differences in their own lives, the lives of others, their communities and/or their professions through ambitious efforts that reflect the scholarly, entrepreneurial or service-oriented spirit of an Iowa State University education.